The meeting on the five design concept plans for the Rebuild by Design on Hudson River project held last night at the Hoboken Historical Museum is off to a rough start. According to one witness, over 100 people showed up with many sharing anxiety over aspects of the plan featuring walls in various guises. Describing the tension as "palpable" the opinions and misinformation about the concept plans were reportedly as varied as the number of people in attendance. 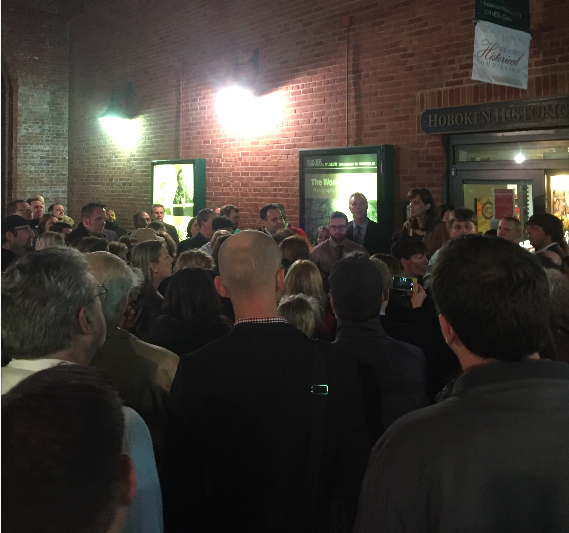 Well over a hundred people came to hear and discuss the Rebuild by Design plans last night at the Hoboken Historical Museum. Opinions were varied, divided and one attendee described misinformed. Anxiety over featured walls in some of the plans was highlighted as central to many fears and concerns. Talking Ed Note: MSV was not in attendance last night due to a conflicting Christmas celebration. 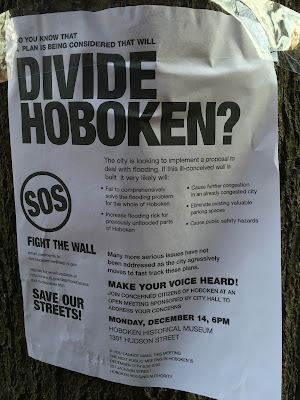 One could and should expect this reception being that perspectives on how to best protect Hoboken in a future Sandy type event will vary widely. Part of the factors driving those views will come from location. Two more meetings are set in Weehawken and the Hoboken Housing Authority. Those additional meetings are scheduled for tonight and tomorrow. An uptown flyer attacked the feature of a wall on the east side of town and was spotted placed illicitly on trees on Bloomfield St. anonymously urging others to "fight the wall."